Just thought I would update the blog here because it’s been so long! We’ve been pretty deep into development on Spectro here. A lot of exciting progress has been made with the ghost AI and how it reacts to the procedural generated levels. That was a tricky challenge but things are coming together. In the meantime we had to push the release date back a bit, we’ll announce the new date here as soon as we can. We’re using Aron Granberg’s A* pathfinding solution for Unity with a lot of custom AI behavior layered on top. That plug in is excellent though so definitely check it out if you’re looking for pathfinding in Unity and the native solution isn’t enough. It came in handy especially for dynamically generating navmeshes at runtime. Something Unity can’t do on its own. In addition to the AI we’ve also got cool things like gated level flow for houses with hidden keys and treasure placed in ideal locations each time a new house is generated. More on this soon. For now, back to coding! Things have been somewhat quiet on here as we continue to develop the new project full time. 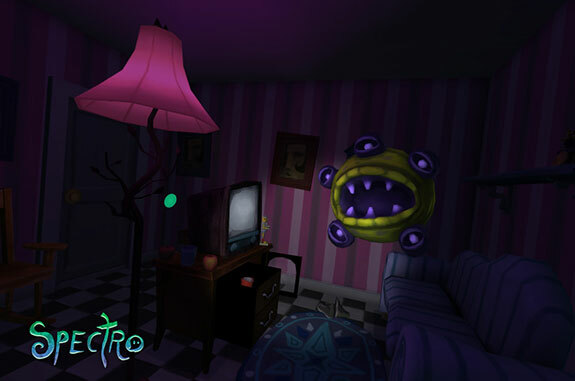 I suppose this is the first formal announcement of the new game on the blog here, so here are a few details: It’s called Spectro, and it’s a game about trapping ghosts and searching for hidden artifacts in the town of Weirdwood. You are the sole proprietor of a ghost detective agency in this strange little town, and you will be clearing many houses of these supernatural pests to see if you can keep your business thriving. I decided to take some time off from developing our next game to get The Night Cafe working with Vive. This experience was originally designed for seated or standing VR without motion controls, although from the beginning I had considered adding support for the Razer Hydra back before motion controls were readily available. The Night Cafe is a very passive experience in that there is not much direct interaction with characters or objects, although you do have complete freedom of movement within the small cafe space. While it would be great to get more interaction with objects in a future version, for now I just wanted to focus on getting the movement mechanics working well enough to get around comfortably using room scale. This experience is fairly well suited for room scale because it is a small space to begin with, although once I started moving around I realized it would require quite a lot of movement of the player’s space within the virtual space in order to cover the full environment. As a result, I decided a simple teleportation mechanic would be most effective given its wide spread adoption in many Vive experiences. What Will the Metaverse Look Like? When thinking about the metaverse you have to consider many factors — accessibility, content availability, interface, social infrastructure, privacy options, and personal expression among many others. If you take it one step at a time you can start to come up with likely scenarios. I had begun the thinking process with an experience in mind akin to MySpace, Squarespace, or Facebook. These are all tools that are (or were) used for some kind of personal expression to be shared on the web. There is of course a distinction to be made between social networks and web site creation tools like Squarespace but they share a lot in common as well. At their core, they make sharing things on the internet very easy and at a low or no cost. Happy Holidays from Borrowed Light! A quick update about what’s been going on at Borrowed Light. I’ve been focusing all my efforts on our next VR experience, a game that will be announced early in the new year. There is procedural generation involved so a lot of time has been spent figuring out what techniques work best for the unique style of gameplay. Most procedural level generation techniques seem to be geared towards sprawling dungeons — which is not exactly what we needed — I’m looking for tighter level layouts which means there can’t be a bunch of empty space surrounding each room, instead I want there to be a compactness to the floor plan. I’ll be going into more detail about my approach in a later post. In addition to that, I’m starting on designs and concepts for the characters and environments. It’s been a process of prototyping and revising before getting to any kind of visual design stage. I think it’s so important to nail your core mechanic before getting into this phase so that’s been my primary goal. I am also hoping to do a post on the “rapidly exploring random tree” algorithm I’ve been putting together for the NPC characters. A lot to come in 2016! We can’t wait to show you what we’ve been working on. In the meantime, happy holidays from Borrowed Light! I went to see a performance of Sleep No More over the weekend and I thought I would write about my experience because I think it’s pretty relevant to VR storytelling. 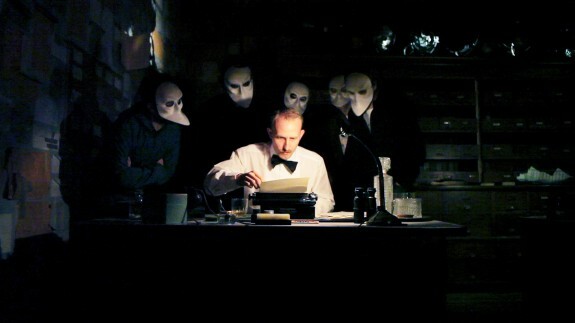 Sleep No More is a play that takes place in a large 5 floor space where the audience can walk through and see the performaces around them without any guidance. The concept of a dynamic performance that unfolds around you is something that VR could potentially do very well. I didn’t know what to expect and I assumed it would be difficult to tell a coherent story in this way. I thought I would walk around and get bits and pieces of the story and that’s about it. This is the second and final part of the Making of Night Cafe series. For part 1 click here. Once I had all the assets built and ready for Unity I constructed the scene. While most of the objects were unique, there were several objects that were duplicated such as the tables and chairs. In order to maintain that handcrafted, one of a kind appearance I made sure to not actually duplicate them in Unity but instead to do it in Maya and then warp each one so they were in fact customized even if they shared the same textures.